Three Counties XC instructions - Event 5 - Bedford. 14th Jan.
We have a great chance of winning the overall league title! :clap: However - its not won yet, not by a long shot - we have work to do! Both the men and ladies are also in podium positions. We need to keep these positions and try our best to improve on them too. Lets all turn out and give it our best effort! 66 individuals have taken part in the league this year. 28 have run 1 race. 14 have run 2 races. 14 have run 3 races. 10 have run all 4 races so far! Kudos to those who have run so far, extra kudos to those who have run all 4 races so far! if you have run 3 races, then running the last race will give you a position in the overall rankings. Don't worry if you haven't run 3 races or more, you can still help the team out massively by turning up at the finale. Bedford Stadium, Barkers Lane, Bedford, MK41 9SB. Park in the stadium car park, Aspects Leisure Park (Opposite) or Priory park further on down Barkers Lane. Please share lifts where possible. Showers and toilets at the stadium. Toilets in Priory Park. There is only 1 lap, with a stream crossing and 5 bridges to cross. The ground may be very wet, spikes strongly advised. The course follows grassy footpaths mainly by a stream and the river. It is a flat course. Re: Three Counties XC instructions - Event 5 - Bedford. 14th Jan.
Would so love to do this but I'm not fast enough for you yet .... Hopefully next year I'll be doing this event. Yes you deserve a mug - it was that cold. Otherwise we would run out of mugs by giving them all to marshalls/spectators! The mug scheme is to encourage a higher turnout of runners for away fixtures, something we have struggled with in the past. Hayley, I wouldn't worry about not being fast enough, I was the tail runner marshall at our event and averaged 15 min miling so I doubt you'd be last...as long as you're happy about wading through the stream a coffee mug would be waiting for you at the end! Lol thats an extreme way of getting a coffee mug I'm currently training for half marathon so will sit this one out and definitely join it next year when Im stronger fitter and faster. John, is it to late to enter for this race? Andrew, nice one! Great to see you want to run, would be great to have you there. We want as many runners as possible for the team and to (hopefully) enjoy the celebrations afterwards. Basically, if you were a club member in October then I have registered you. I registered every club member and assigned them a number. I carry them around with me. Looking at the numbers I have allocated, I think I have one for you (obvs not sure on surname). All you need to do is collect it from me. I will have them at the club next week, or on race day. I will bring them to FSOTM tomorrow too, if you are planning on coming down? Incidentally, if you weren’t a member then, but are now, then I can register you and assign a number. I can do this up untill mid day before the race. Hi John, perhaps I could collect my number on Thursday night training. Got some further instructions on the course today. 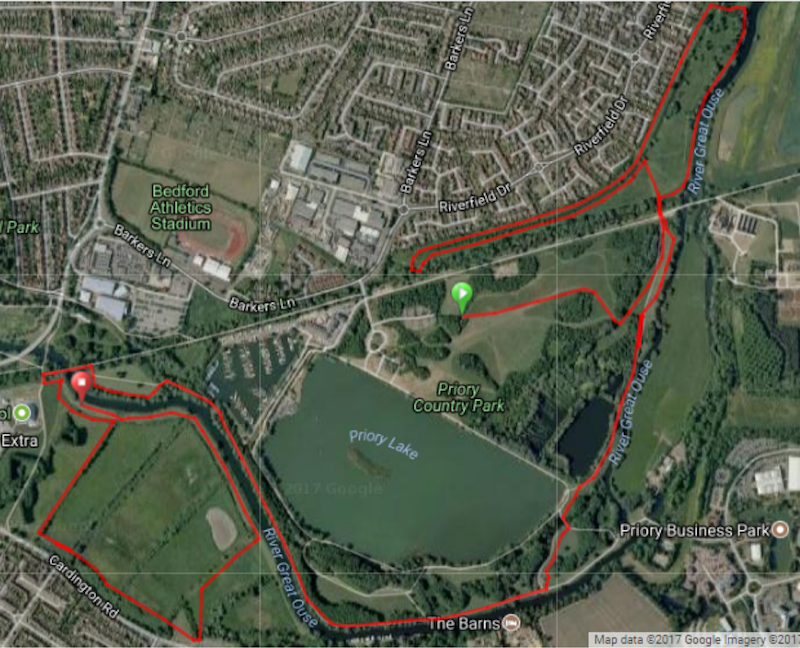 The route may change if there is a lot of rain between now and Sunday as some of the route is currently under water. Please keep an eye on emails, Facebook and the website on Saturday for any further updates. The route currently is 5.2miles. Yes looking forward to it. Due to flooding the route has had to change slightly. The HQ is still at Bedford Stadium and parking still at Aspects Leisure Park. The course is now 4.4 miles long, with the start and finish at the same point. Spikes are advised, but please advise your runners that there are some short concrete paths. Runners will still get wet feet! It is about the same length as Wootton was this season, except Wootton had about 107m elevation. The start and finish are now at the same point too, which is a bit better logistically for kit. If anybody wants some more inspiration then this Saturday is the Great Edinburgh XC. If you don’t want to run, how about support? Sad to report I have an injury... feels like someone has shot me in the calf, which is probably an over dramatization of a hamstring tear. It's happened on both of my last runs, so will sit this one out and hope to recover for the Mid Week League races. However that means I can take scores if needed? Am sure Team NHRR will have a great turn out for this one, and thoroughly enjoyed running in the last 2 races - which is probably why I'm injured as ran much faster than my rather patchy training had prepared my body to cope with! I’d love to have you there for support and to help with the numbers please, yes. I’ve got you a number Helen. See you Sunday! Really pleased to have given out a few numbers in the last few days, anybody else? I’m really looking forward to Sunday! If it is not too late, could Myself and Marcus be added to the race on Sunday? Niamh, all you need to run is a vest and a race number. Have you kept your race numbers from the race you did previously? It’s the same number for the whole league. If you’ve lost it, we can get a replacement on the day. So all you need to do is turn out on Sunday. Hope to see you there! We have our vests but no numbers - sorry about that. If you could get some for us that would be super. Should we aim to be there around 9.45? Does not look like a big walk to the start.